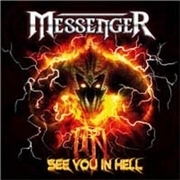 German true metal merchants MESSENGER return for a second shot at stardom with “See You in Hell”. With such a MANOWAR 82 image they have of cause played Keep It True and Headbanger´s Open Air, plus supported RUNNING WILD and ROSS THE BOSS. The leather clothing must be pretty hot in southern Germany, but they mean business and stay true to their aim at playing catchy metal with hooks and energy. How true are they really? Opening intro “Flames of Revenge” is a like a declaration of independence. The cover opts for more children´s cartoon TV style, but MESSENGER head straight into the title track instead. The folky guitar work hints at some new ideas, and the song ought to go down well in the right (magic) circles. The simplicity of the old gods returns in “Make It Right”, with a stubbornly straight refrain. The band returns to better form with “The Prophecy”, an epic fairytale with more than a fair share of IRON MAIDEN, early HELLOWEEN and MANOWAR in its veins. The on and off character of varied song quality goes on, with the pits represented by the turkey “Alien Autopsy” with its lack of refrain, old school and only a downright poor sound picture to rely on. The opposite happens towards the end of the album. The band then presents aces like “Lindisfarne”, “The Land of the Brave” and “Valkyries”. The pompous, epic and sword-vielding side of MESSENGER may have a penchant for Vikings, which is alright (“Into Glory Ride” anyone?). Their folky touch may be more modern that they would really like, but rightly used it will be their stronghold. The ending of “Dr. Stein”, originally by HELLOWEEN, is like Luton Town giving away a penalty shot to a Premier League club as if they needed it… With some refinement the high-pitched vocals of Siggi and twin guitar attack of Frank and Patrik will live long and prosper in the land of leather clad warriors… but for now it´s too uneven.